Court Sessions are held at 1:00 P.M. and 4:00 P.M. on the first three Tuesdays of each month and at 1:00 P.M. on the fourth Tuesday of each month. Payments to the court may be made in Cash, Check or Money Order. 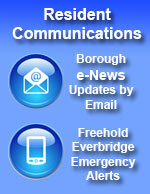 Please make all payments payable to the Freehold Borough Municipal Court. If you wish to pay a ticket online, please visit www.njmcdirect.com and your payment will be processed. If your driving privileges are currently suspended in the State of New Jersey, you must take your receipt to Motor Vehicle Services to have your driving privileges reinstated. If you received a ticket and wish to plead not guilty, you must contact the court office seven days prior to the court date listed on the ticket.